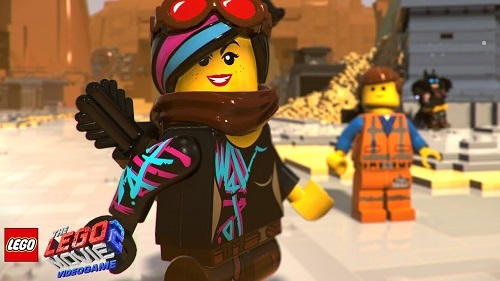 The LEGO Movie 2 just came out in theaters, so naturally there’s a video game about it, too. I expected it to be like any of the other LEGO games where you tromp through 12 to 15 levels, breaking bricks, building structures, and collecting studs along the way. But nope, to my surprise this game based on the movie is totally different! Well, it’s not completely original, as it plays very similarly to a game I reviewed a couple of years ago called LEGO Worlds. This new game is available for nearly all current home consoles and PC, but reviewed on PS4 here. Each level is a small open world that you can freely explore, and most are based on the new movie. You’ll meet characters that will have favors for you to do, like fetch quests, building a certain item, coloring a certain structure, or defeat a group of baddies. Certain quests will move the story along, and it’s nearly always clear what you need to do. Fulfilling quests will earn you rewards like new characters to play as, items to help you move around and solve puzzles, and special Master Bricks which will unlock new levels once you collect enough of them. Sometimes in the story mode, you’ll have to do a small platform jumping obstacle section or defeat a giant Duplo ‘Shadow of the Colossus’ style boss, which are some of the high points in the game. Usually when you meet a new character from the movie, you can play as them. It doesn’t really matter which character you play as, though, as they are mostly all the same. Also, when you get a new main character to play as, you’ll get an item that you can switch to that’ll help you solve puzzles or get around. Some of these items include a grappling hook, paint wand, and fists for breaking special blocks. Two of the most important items you’ll use are the binoculars and building plans. Using the binoculars, you can scan certain objects and build them at any time by using the building plans. You’ll do this most in the story mode to build things like trampolines or power generators to help move the plot along. Aside from the main story world, you can also unlock and visit some side planets for you to explore and collect more bricks and build more stuff. These include a Wild West world, Planet Unikitty, Classic Bricksburg, and more! Find hidden treasure chests for studs, LEGO bricks for building things (it’s hard to run out, though, as you get so many), and special capsules that you can open at shops to unlock more things to build and characters to play as. There are even some extra sandbox planets where you can just build whatever you want for fun, although you can also do that in any of the worlds. You can’t build your own structures brick by brick like you could in LEGO Worlds, though. However, there are tons of premade stuff to build here. While it’s nice that the game is different, it’s not a perfect game. Loading times between planets are atrocious, and the graphics take a bit of a hit with this new style of play. Camera angles and getting stuck were a quibble a couple of times, and there were a few instances where the goals were not quite as clear, but those times were few and far between. Also, the main story mode is a bit shorter than most other LEGO games, and if you were expecting it to play like most of the other LEGO titles, you’ll be disappointed. But I was pleasantly surprised to be able to play something a little different than usual, and it makes me wonder if they could make other LEGO games different, too. Like maybe a LEGO Teenage Mutant Ninja Turtles game that plays like the arcade game, or how about a LEGO RPG? The possibilities are endless with the LEGO toys and the games should be the same way, too. The LEGO Movie 2 Video Game is rated E-10 with an ESRB descriptor of Cartoon Violence. You can punch and sock LEGO baddies that just break into pieces when defeated, but that’s it. Reading skill is needed for some of the text. If you’re OK with your kids watching the movies, they’ll be OK with the game, too. Because of the focus on creativity, the game could be considered slightly educational as well. WB Games sent me this game for review purposes. boy, this one landed with a thud.